Almost every comic book fan knows that the earliest comics were in the form of cartoon strips that appeared in the daily newspaper. Instead of pages, they were actual strips, kind of like the ones you get when you use a photo booth. Each strip contained a certain number of squares which depicted the scenes of the story. Depending on the comic you were looking at, some would read from left to right while others would read from top to bottom. Some had dialogue bubbles while others just had characters doing whimsical actions without dialogue. Unlike the comics of those days, however, modern comics don’t have a simple clean-cut square dynamic anymore. No, these days, the pages of comics are much more intricate. Very few scenes are depicted as simple squares; instead they are placed within odd shapes such as rhomboids and trapezoids. Characters are now overlapping each other and are no longer restrained inside their correspondent boundaries. Not only as readers but as an audience, we are able to see the adventures of our favorite characters through 3-dimensional angles; gone are the days where we had to look at our characters in 2 dimensions. 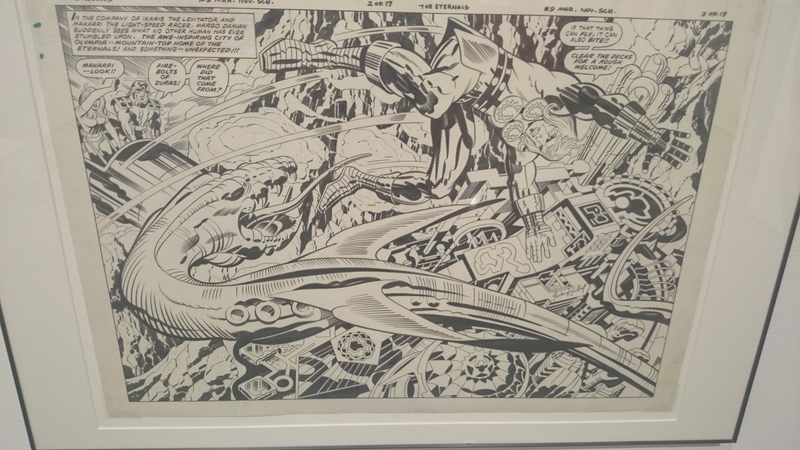 One of the first artists to employ this aesthetic was none other than Jack Kirby. Instead of following the trends of his colleagues, he took a different route by making the comic book reading experience much more immersive for his audience. This could be shown in the comic page above this paragraph. The page comes from The Eternals, a short lived Kirby comic book series from 1976. Take a minute to examine the image carefully. Try to take in all that’s going on: the spectacular cityscape in the background, a strange flying creature and the character that seems to be leaping over everything. Now go to the comics strip section of your newspaper and compare the two images. I guarantee you most of the art found in the newspaper is not as intricate and complex as the image of above. One contributing factor to this is that the page above is 3-dimensional; meaning you actually feel like you’re in the center of the action as its happening. However, when you read the newspaper comic, its 2 dimensional, thus it feels less alive and the characters feel, well flat. Thanks to pioneer artist like Kirby, we are better able to immerse ourselves into the world of comics and get involved in the action.